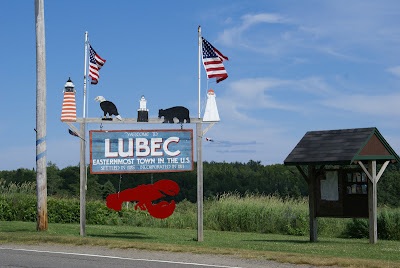 Lubec? Never heard of it, right? Well, it's time you do. It's the easternmost town in the continental United States and Eastport is the easternmost city. Both are in Maine. 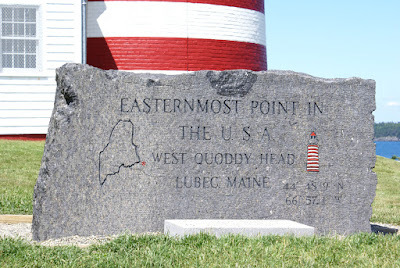 The easternmost point in the United States is the West Quoddy Head Lighthouse, Lubec. 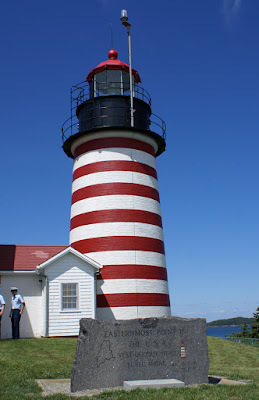 They were celebrating the 200th anniversary of this historical lighthouse when we drove through Maine earlier this year, in July. West Quoddy but easternmost? That's because the East Quoddy River is to the north in New Brunswick, Canada. Isn't this a magnificent lighthouse? Here's another picture from the front. The United States Navy controls the lighthouse and we were the last but one family that was allowed into the lighthouse before they closed for the day. Here's Medha looking down and getting ready to take pictures. I felt sick looking at how close she was to the two horizontal railings and how far apart they were and how petite she was. Sail Rock, just off West Quoddy Head, is the easternmost point in the USA. 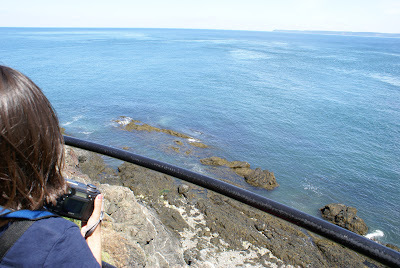 The mainland you see beyond that is Campobello Island, Canada. We didn't have enough time to go puffin or whale watching. Maybe next time! pics look beautiful....how was the weather in july... must be cold in maine? Loving this post as New England is near and dear to my heart. 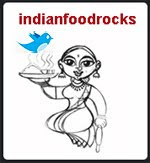 Just discovered this site and wow - you had me at the Kerala cuisine posts. I am married to a Malayalee and I am a devoted follower of Maya Kaimal's cookbooks. I will be ordering Ammini Ramachandran's book shortly and cannot wait to try some more Keralite goodies. Nice info and beautiful pics. I would feel sick too if I would have been that close. 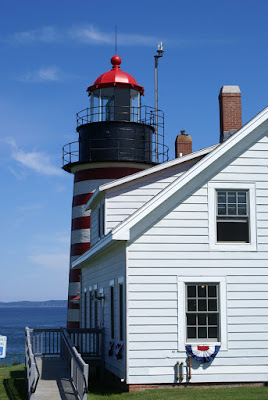 That light house is really magnificent.Good to know about Lubec. Nice pics of the light house! Lucky you - did I say that you have too much fun?! Rachna, weather was hot and muggy. Mainly in the 90s. Cagey, welcome! 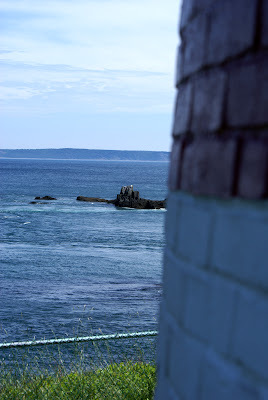 I fell in love with Maine, which is why we ventured so far east. I have not heard of Maya Kaimal but will look her up. I am a huge fan of Ammini and her recipes. I turn to her book for our veggie fix and am never disappointed. Ammini has won more hearts and appetites than just mine. Feast your eyes on this while you wait for your book to be delivered. I was wondering who was behind FoodieBytes. Now I know! Best of luck with that project - it's something I could defnitely use! Anita, but then you know how hard we work, right? Love Maine! Its fun in every season :). Those are some great pictures, Manisha! No whale watching? Do go for it next time ;). Manisha outside Thal in the sea we have the Khanderi Island that has the world's only lighthouse still run on diesel and the prisms are absolutely awe inspiring. A wall it built to avoid light flashing towards the mainland else Thal would not have night at all. It is controlled by the Mumbai Port Trust and the Indian Navy and needs prior permission to visit there. I hope to visit it the next time I'm in Thal. Musy, Medha and I were very keen but my s-i-l who lives in Halifax has consistently had bad luck. Ever since we came back, I have been seeing fabulous pictures of whales, puffins and dolphins from this summer and I've been kicking myself that we passed up on it. Therefore, next time! Anjali, you make me want to come with you on your trip to Thal! You are very lucky!